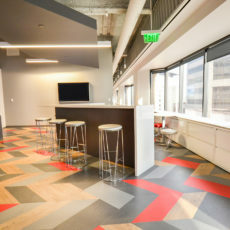 Walking the talk: Taking the office environment to the next level. Cushman & Wakefield is a leading real estate services firm that helps clients transform how people work, shop, and live. 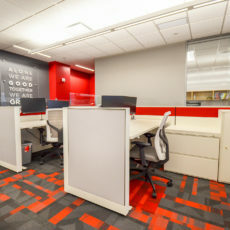 The firm’s Indianapolis office recently transformed, too. 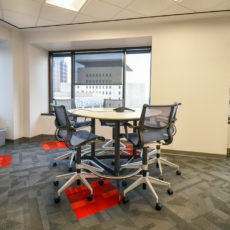 When they moved from the 13th to the 18th floor of the OneAmerica Tower, they elevated their environment in more ways than one. 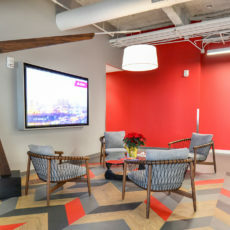 Previously located in an office with 6-foot-tall cubicles and hard-walled offices along the perimeter, Cushman & Wakefield needed a space that implemented new corporate guidelines designed to foster collaboration. 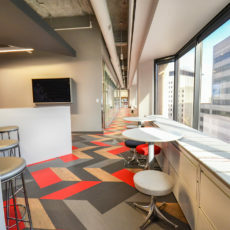 Along with Schott Design, OfficeWorks created an environment that meets Cushman & Wakefield’s overall vision while fitting its local culture. 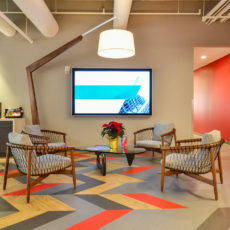 As part of that process, OfficeWorks facilitated a trip to Herman Miller’s corporate headquarters in west Michigan, where Schott Design and Cushman & Wakefield could explore trends and workspace configurations. 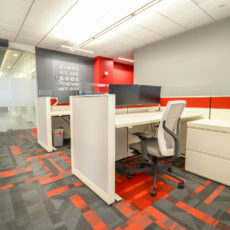 In addition, from 3D renderings to a mock-up workstation, OfficeWorks used strategies to gain input, drive decisions, and modify furniture prior to purchase. 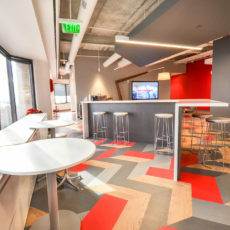 Cushman & Wakefield’s new space increases transparency and the availability of spaces everyone can use, yet reduces the size of workstations—a change that tasked OfficeWorks with incorporating storage and technology needs into a smaller footprint. “I enjoyed the challenge of thinking through ideas that would meet the budget without compromising function,” said Camille Inchauste, OfficeWorks’ account executive. For example, when employees wanted additional storage incorporated back into the design after the budget had been set, OfficeWorks refurbished existing file cabinets and integrated them into the layout. 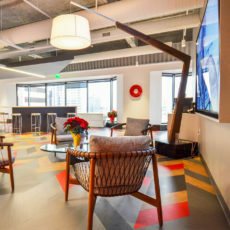 “The whole team was adaptable and great to work with,” said Kristin Coyne, marketing manager at Cushman & Wakefield. 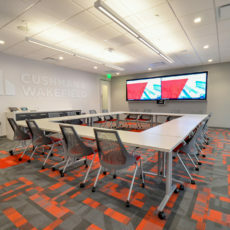 Cushman & Wakefield’s new office invites interaction, accommodates technology, and supports different ways of working. 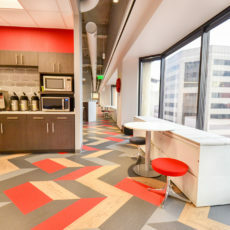 In their previous space, employees could go days without seeing certain colleagues. 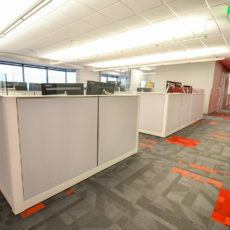 “The most frequent comment I’ve heard is that employees are now able to see outside and see each other,” Chris said. “More people are collaborating and talking to one another. It’s open and bright and has a whole different feel.” In addition, the team has embraced the height-adjustable workstations, appreciating the versatility. The office has been great for recruiting purposes, too. “When we bring potential employees through, it shows we’re responding to where work environments are going, from open layouts to technology,” Kristin said. 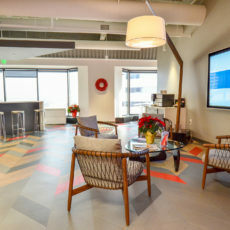 Cushman & Wakefield also brings clients through the space a couple of times a week. “It’s great that we’re living what we’re telling them, in terms of how they can make space more collaborative,” said Chris.